By Ran Avrahamy in Mobile. Updated on August 3, 2018 . App install advertising is on fire. 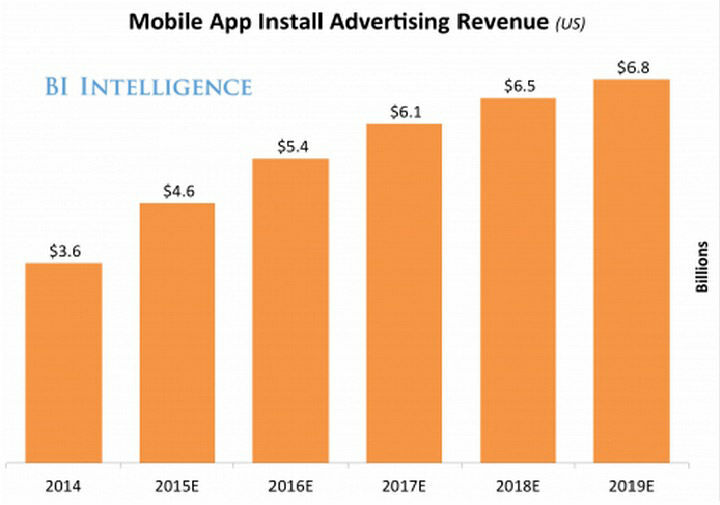 BI Intelligence predicts that US mobile app install ad revenues will top $4.6 billion this year and grow to $6.8 billion by the end of 2019, growing by 14% a year from 2014. Beyond quantity, there’s also quality with the best ROI of all mobile ad formats. A key development driving the surge in app install budgets involves the ability to properly measure app install campaigns, overcoming the lack of cookies and the inherent fragmentation in the mobile ecosystem with its different environments (mobile web and in-app), different platforms (iOS, Android, Windows Phone), and different devices (smartphones and tablets). Furthermore, advertising analytics enable marketers to move towards a pure performance model in which an install, important as it is, is only the first step to success. What happens after the install is what matters. By connecting in-app actions to a network that drove an install, the marketer can pinpoint the networks that can deliver the specific type of users that drive value to his business. In order for your app to be noticed, and stand out from the other million apps in the mobile space, it’s essential to generate a volume of installs from both organic and non-organic sources. What’s the difference you ask? Well, organic installs are installs that are mainly the result of app store exploration and organic search. This means an application is discovered and installed after a keyword or brand search i.e. after a recommendation from a friend, looking at top apps per category, or being exposed to an app through an app store’s own featured recommendations. Non-organic installs, on the other hand, are driven to the app store by active promotions outside the app store whether via a paid advertising campaign, or any other marketing campaign on owned channels (such as email, push notification, SMS or QR code). In mobile app install advertising, it’s essential to make the most out of both routes. Driving the highest number of organic installs involves using App Store Optimization (ASO) tactics (which is is basically the app world’s equivalent to Search Engine Optimization (SEO)). There’s a short list of factors that can either make or break your ASO ranking, i.e. title, keywords, number of downloads, ratings and reviews, screenshots and icons, etc. 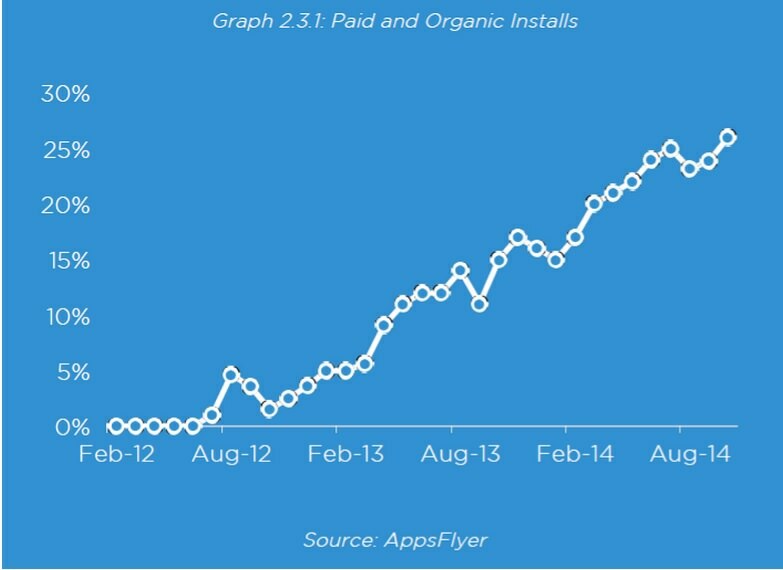 Since the number of installs is a major factor in ASO, paying for new users will not only increase the number of non-organic installs, but more importantly the number of organic installs. In fact, our research has found that 1 paid install drives 3 more organic installs. Paid app install campaigns are also a way to stand out in a saturated marketplace (there are over 1.4 million apps on both Google Play and the App Store!). In its recent report, eMarketer went as far as saying that it is a must. Payment Terms: Pre-determined price for every 1,000 impressions (cost per mille – mille being the Latin term for one thousand). Cons: Non-performance model, greater chance of non-transparent networks sending low quality impressions. Payment Terms: Paid every time a user clicks on an ad. Pros: Easier to analyze user engagement through ad creative A/B testing. Cons: Fat fingers phenomenon means you risk paying for unintended clicks and damaging your brand name with awful user experiences; Higher cost than CPI if you don’t have the resources to optimize click-to-conversion path, lack of robust analysis tools, vulnerable to fraud. Payment Terms: Pre-determined price paid every time a user installs the application. Pros: Performance model, lower cost, low risk. Cons: Risk of non-transparent networks driving a high volume of low quality or incentivized traffic to drive installs. Payment Terms: Pre-determined price for every in-app action defined by advertiser (revenue or engagement related). Pros: Pure performance model adopted by the savviest data-driven advertisers. Cons: The cost is often higher but so is the value generated so ROI only grows with higher LTV of acquired users. If you’re trying to target specific user personas while maintaining a strict budget, Twitter and Facebook are great places to start for their almighty data and in-depth demographics information about their audiences. Google AdWords app install campaigns can also be great when working with a tight budget. Here you can focus on your keywords – tapping into user intent as a powerful indicator – and invest more incrementally until you’ve achieved optimal keyword optimization. This is great for longer campaigns that are intended for a large audience. If budgets are higher, YouTube features TrueView ads which can be a great option. Particularly if you have a video preview of your app that you’d like to expose to a targeted and engaged audience. To maximize reach and the ability to find the media sources that can deliver specific users you are interested in, adding other ad networks to the mix is an important step. But with hundreds and even thousands of them out there, how will you find the best network for your app? At any given time a typical app could be working with anywhere from 5-10 different mobile ad networks. Big apps work with dozens at the same time. It’s therefore essential that you allocate your budget responsibly so you don’t wind up wasting it on publishers that are unable to meet your acquisition goals. With so many mobile ad networks working with different traffic types, unique verticals, and specialized clientele, you need better methods to avoid poor performing publishers. How are you different from your competitors? Can you give us an example of what you’ve done for one of your advertisers in our particular vertical? Where do you wish to be at the end of this process? What are your goals you want to achieve by working with this ad network? Even though you’ve made an educated decision about which networks to run with, it goes without saying that you must monitor their performance at all times. You should feel comfortable saying to the network, "hey, publisher number 4 is operating poorly compared to number three, please allocate more budget to number 3." The network doesn’t have the same level of data that you have as an advertiser so it’s important to help them complete the larger picture. Stay in the loop and inform them when you see something going the wrong way. Measuring app install campaigns involves two critical and intertwined parts: attribution analytics and advertising analytics. 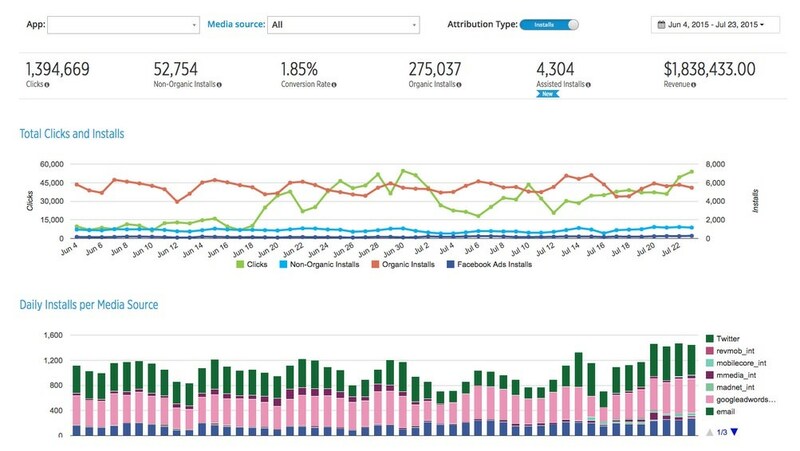 Attribution analytics tell us the channel/source that delivered each app install, whether organic, social, paid or owned. The mechanism is mostly based on the last click model – the last touchpoint a user clicked on before installing (and launching) an app (within a grace window of 7 to 30 days). This model dictates that the advertiser only pays the network that delivers the last click (if engagement with a another non-paid source like email or organic search follows, the ad network doesn’t get paid). Unbiased attribution companies serve as an impartial judge – trusted by both advertisers and networks alike to make a ruling. The fact that they are integrated with hundreds of networks means that they have a bird’s eye view of the entire conversion path. As such, they can make a decision that sticks while preventing advertisers from being double or triple charged by networks a user clicked on but were not the last click. Advertising analytics takes it one step forward. By measuring what a user does after the install and connecting it to the acquiring source (paid, social, owned or organic), you can view aggregated data and pinpoint the networks that delivered the best users. For example, if a gaming developer knows that passing level 10 is a strong indication of high lifetime value, he can measure this in-app event and find out which networks delivered the highest number of these players at the best rates, and which did not, then optimize accordingly. In an app environment dominated by the freemium model, delivering quality users who drive real revenue is an absolute must. After all, you can’t go to the bank with installs. The digital environment is not only mobile first – it is app first. However, its big numbers have also created a hyper competitive space in which few apps make it, and most break it. To succeed, marketers must run app install campaigns and make smart, data-driven marketing decisions to break away from the crowd and ensure their budget is maximized to its full potential. Editor’s note: This guest post is written for Hongkiat.com by Ran Avrahamy. Ran is the Head of Marketing at AppsFlyer.com who is managing a complicated relationship with mobile. He also loves being an entrepreneur though he hates the word "entrepreneur". Find him on LinkedIn and Twitter.